The stand of Yamal at the largest tourist exhibition in Moscow MITT was visited by the deputy chairperson of the government of Russia Olga Golodets. This information was given to the news agency “Sever-Press” in the regional department of youth policy and tourism of Yamal-Nenets Autonomous Okrug. As she notes, northern regions deserve increase in tourist flow, and everything being presented at the stand of Yamal, in her opinion, will be attractive for tourists. Olga Golodets wished the region for success, because original culture of indigenous ethnic minorities and unique polar nature are ones of the most important, attractive points for tourism development. 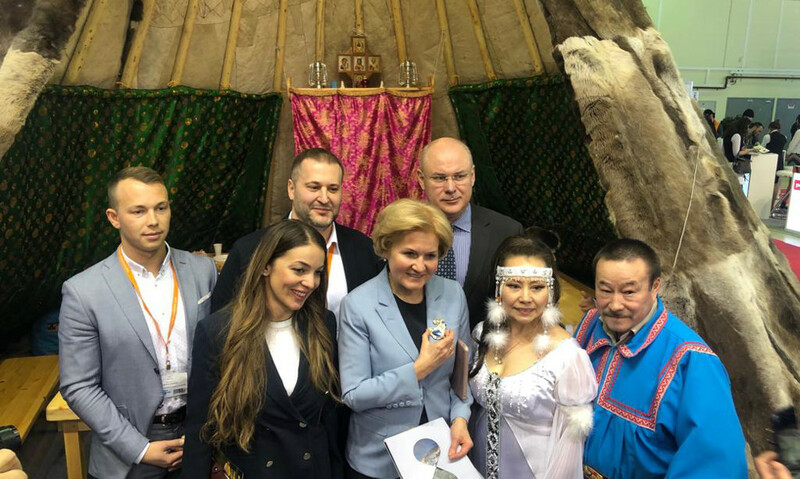 The representatives of the delegation from Yamal gave a present to Olga Golodets – a brooch made by a Khanty craftswoman Irina Kosacheva. The head of the Federal Tourism Agency Zarina Doguzova also expressed interest to the exposition of Yamal. She visited a choum, tasted northern delicacies and marked national distinctness of indigenous ethnic minorities of Yamal. (A choum is a dwelling of nomads, reindeer herders; it is similar to a tepee). “We shall help”, she said in the conclusion of her visit to the venue of Yamal. As we should remind, in Moscow the 26th international tourist exhibition MITT took place from the 12th to the 14th of March. The delegation included heads and representatives of the department of youth policy and tourism of Yamal, the company “Yamal-Tour”, the regional department of economy, tourist business and soloists of the Cultural and Business center. As we should note, MITT is a tourist exhibition number one in Russia. It is included to the top 5 leading tourist exhibitions of the world. By the right it received wide recognition of the international tourist community and is a significant event in the sphere of tourist business. Companies from more than 200 countries and regions of the world participate in it every year. The group of companies ITE – the leader of exhibition business in Russia – is the organizer of the exhibition.